1. Fill a large pan with water and bring to the boil. 2. Use a skillet with olive oil in to toast the almonds over a high heat. Add a pinch of salt and fry until golden brown. Remove from the heat and set aside. 3. Combine the garlic, salt, jalapeno and cilantro together to make the dressing in a food blender. Alternatively this can be done with a hand blender. Drizzle in the olive oil while pulsing and continue doing this until you get a vibrant green, creamy mixture. Taste and add more of the ingredients according to your preferences. 4. In the large pan of boiling water, add salt and then the carrots. Wait for 15 seconds before adding the asparagus. Cook for 30-60 seconds depending on the thickness of your asparagus/carrots – the vegetables should retain their structure and have some bite. 5. Drain the vegetables under cold water and then spin/toss them dry. 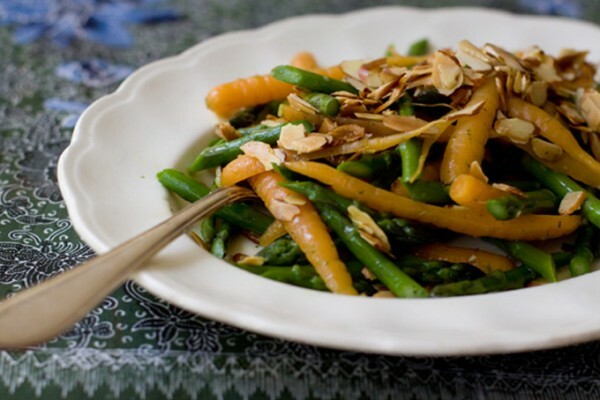 Into a large bowl toss the vegetables and dressing, then add the toasted almonds, tasting and adjusting with seasoning. You can add lemon juice at this point, but this is optional. Serve in a big bowl with the remaining almonds on top. Enjoy!